Here you can find the information about your Campaigns page and how to create, open, run, pause, arhive, remove or duplicate your sequences. Run, pause, archive, remove a campaign. Add people, duplicate, save as template, sort campaigns. Change campaign owner (if you are the team owner in a Team Edition account). Archived campaigns are hidden by default. You can see them using the Archived filter or by scrolling down the list of campaigns on the page. If you archive old campaigns instead of deleting them permanently, you can use them to compare performance metrics - PEOPLE, OPEN RATE, REPLY RATE, DELIVERED. Note: if you plan to quickly find and use prospects from the archived campaign, move them to a separate list before archiving the campaign. PEOPLE. Number of contacts participating in the campaign. OPEN RATE. Number of opened emails. REPLY RATE. Overall campaign performance; can be high, med or low. This indicator is based on reply rate: 0-3% - Red, 3-10% - Yellow, more than 10% - Green. PROGRESS. The progress bar represents the ratio between Active and Finished prospects currently. The more prospects receive the Finished status, the higher is the overall campaign progress. DELIVERED. Number of delivered emails and ratio between the Total people and Contacted key metrics. Campaign folders help you group and organize multiple campaigns on the Campaigns page. To add a campaign to a campaign folder, click on the arrow on the right and click Move to folder. When you hover over any campaign, you see additional actions, available with this campaign. 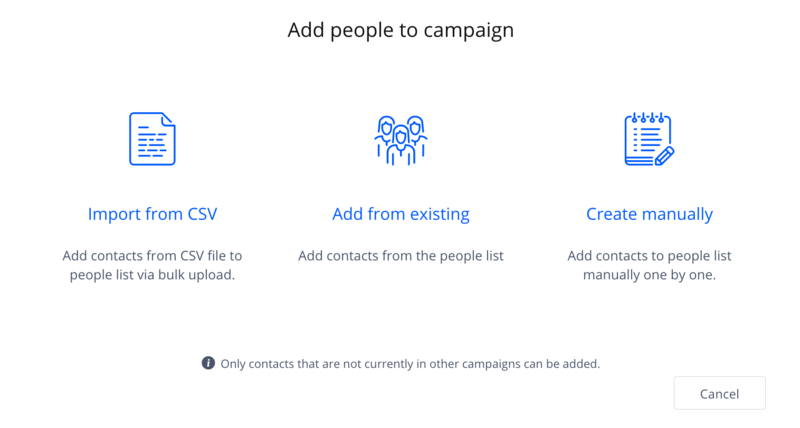 The Add people action lets you add people to the campaign. When you click on the action, the system opens the Add people to campaign popup window, where you can add people by using the Import from CSV, Add from existing or Create manually options. The Duplicate action lets you create a copy of the campaign with the settings of the original campaign. However, you must add people to the duplicated campaign and manually launch it as the campaign has the Paused status by default. The Archive action lets you archive a campaign. To do this, you must first move the campaign to the Paused status. Note that you cannot unarchive the campaign. You cannot perform any actions with the archived campaign. You can find archived campaigns in the Archived list at the bottom of the Campaign page. Use this action if you have many old campaigns that you do not want to mix with active campaigns, but you need to see metrics for performance comparison. The Remove action permanently removes the campaign from the system. Important!!! There is no way to restore the removed campaign. Be careful with this action.